Dielectric Constant is used to determine the ability of an insulator to store electrical energy. The dielectric constant is the ratio of the capacitance induced by two metallic plates with an insulator between them to the capacitance of the same plates with air or a vacuum between them. Dissipation factor is defined as the reciprocal of the ratio between the insulating materials capacitive reactance to its resistance at a specified frequency. It measures the inefficiency of an insulating material. If a material were to be used for strictly insulating purposes, it would be better to have a lower dielectric constant. When a material is to be used in electric applications where high capacitance is needed, a higher dielectric constant is required. The test can be conducted at different frequencies, often between the 10Hz and 2MHz range - the specific frequency is determined by the customer. A sample is placed between two metallic plates and capacitance is measured. 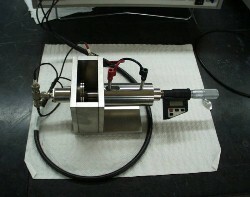 A second run is made without the specimen between the two electrodes. The ratio of these two values is the dielectric constant. 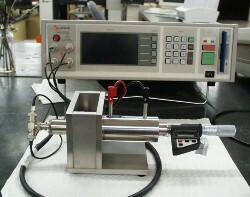 The sample must be flat and larger than the 50mm (2 in) circular electrodes used for the measurement.